I got the above chat request a few days ago. This came in Hangouts, which is tied into my GMail. I opened it today. 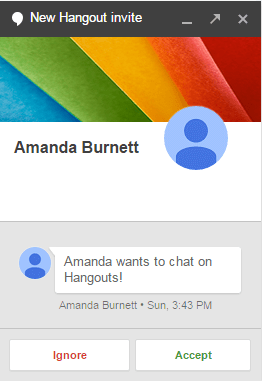 Amanda wants to chat. OK. But, who’s Amanda? No where in the above window is there a link that goes out to Amanda’s Google+ profile. I can’t even see Amanda’s gmail ID from this dialog. But that’s supposed to be a moot point if I can get access to her (it’s?) Google+ profile. But if I can’t see either of those, how do I know it’s spam or a legit chat request. To err on the side of caution, I’ve Ignored, Reported and Blocked Amanda. This is why the Google+ integration failed from the get go. If you’re going to shove it down our throats, at least be thorough with it.